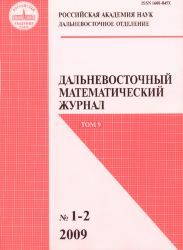 Far Eastern Mathematical Journal is a halfyearly journal publishing the research papers in all areas of pure and applied mathematics and mechanics. In addition, reviews and notes in these and related fields are published. G.V. Alexeev, I.L. Artemjeva, V.I. Bernik, A.A. Burenin, A.Yu. Chebotarev, K.A. Chekhonin, P. Cinterhof, A.E. Mironov, K.V. Nefedev, Yu.V. Nesterenko, T.E. Panov, A.G. Podgaev, I.V. Prokhorov, S.I. Smagin, Ch. Tsi, G.Sh. Tsitsiashvili, A.V. Ustinov, M. Vershigroch.